With the amount of attention and press that hoarding has received recently, it is critical that Professional Organizers share the deeper issues behind this disorder. As such, I’m excited to share a recent interview with Sheila Delson, CPO-CD a Certified Professional Organizer in Chronic Disorganization, ADHD Expert, Hoarding Specialist, and Master Trainer for both the Institute for Challenging Disorganization (ICD) and the National Association of Professional Organizers (NAPO), and 20 year industry expert to guest post on behalf of the topic. How long have you worked with hoarders? I have worked with the hoarding population for about 16 years and am a trained CD and Hoarding Specialist through ICD. What credentials should a professional have prior to working with hoarding situations? Some hoarding situations have multiple potential liabilities and ethical issues and concerns. At the VERY least, people who seek help should find a Professional Organizer who has multiple experiences working with this population and their special needs. Also, professionals should have full coverage liability insurance. It is highly suggested that professionals have experience with this population prior to working. Organizers who are members of NAPO and ICD have exposure to the lastest education and information, and industry experts for help. Are those who compulsively hoard aware of their situations? Many are aware, and many are not. Poor insight is often a great contributor to extreme clutter situations (not only in hoarding issues), which often causes denial and refusal for help. Even for those who are aware of their circumstances, the ability to change is extremely difficult and painful, which causes a lot of resistance to help, even when the know they need it. While some of us may be well trained and have knowledge about CD and compulsive hoarding issues, we are not qualified mental health professionals, and it is important that we distinguish our roles accordingly. I will not not work in a hoarding situation unless the client has a strong motivation to change and is working with a mental health provider or therapist to assist with the emotional and psychological issues that will result in the work process. Have the reality tv programs on hoarding helped or made a difference for these groups? I suppose in some ways, it has been helpful in terms of bringing ‘awareness’ to the general population and society as a whole. However, I also believe it has not been very educational in terms of developing compassion and understanding about the true issues involving compulsive hoarding and acquiring. It is a true mental health condition…not a character issue. Some of these individuals are very passionate, some are well educated, warm and sensitive (although overly so) people I’ve ever known. However, their sense of reality and perspective has been distorted by some type of physiological and psychological illness where their things take on a life of their own, and those things are psychologically ‘attached’ to their selves…separating those things from them in crisis intervention is like doing an amputation without anesthesia…the emotional pain is overwhelming and sometimes the hemorrhaging effects are fatal. We must be careful to DO NO HARM! How long do hoarding situations take to remedy? I personally never offer a project timeline with hoarding situations because there are a myriad of unknown issues that always occur (such as time & coordination with others) that are beyond our control. I will not work under situations where there is an immediate deadline or a cut-off. Unless one is doing an emergency/critical clean out (an “amputation” of sorts), time and money to fund the process will usually run out long before results can be achieved. Do family members help or hurt the situations if they offer to help? I guess that would depend upon the family member – but it is unusual to find a family member who doesn’t have their own agenda or other relationship issues involving the hoarding member. Negative family dynamics can completely derail progress. The book I recommended (Digging Out) offers a strategy alternative “Harm Reduction” plan for family and friends. I fully support this approach. What advise do you have for people who want to help loved ones? First of all, the term “hoarders” has become commonplace, yet can be very triggering and destructive to the people who are labeled. It is important that sensitivities exist around labeling people. It’s advised to instead, label behaviors such as using the terms: compulsive hoarding, or hoarding behaviors vs. labeling a person demonstrating those behaviors. That said, compulsive hoarding and squalor living situations represents a serious mental illness, both psychological and emotional, and without knowledge and experience you could do way more harm than good. ICD does not recommend that anyone (even a trained Professional Organizer) work solo with Hoarders at the Level IV and above situations without a well defined and coordinated TEAM of professionals. 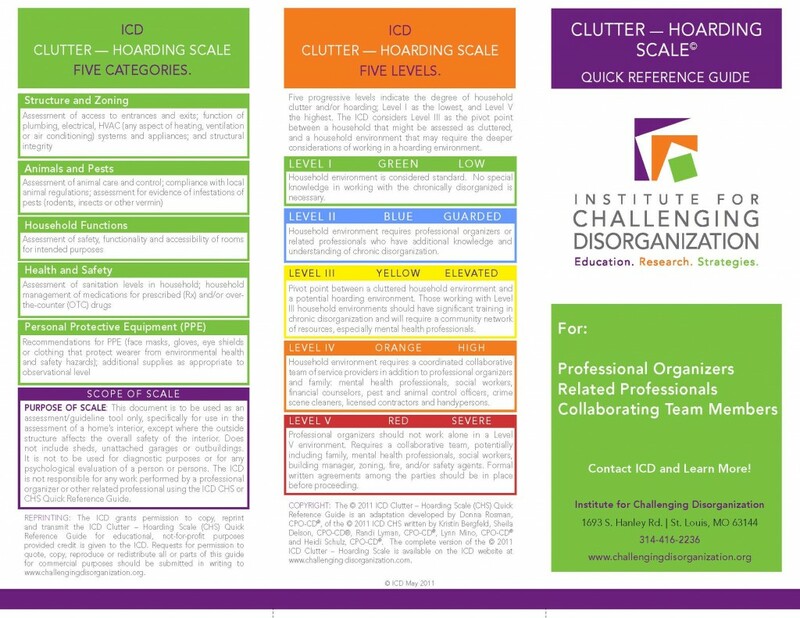 ICD Clutter-Hoarding Scale is a FREE downloadable, environmental assessment tool, available on the ICD website here. The ‘tipping point’ for hoarding BEGINS at Level III and continues upward through Level V.
Do people really require Personal Protective Equipment? Aren’t people actually living in these situations? The Clutter-Hoarding Scale details the types of PPE suggested for each of the five levels, so much will depend on what Level the situation has been assessed for. I highly support these recommendations for the direct purpose of self-care. While it is true that the client may well be ‘over-exposed,’ it is important to understand that ‘poor insight’ and long-term exposure to potential pathogens may have caused a desensitization – a high tolerance or denial…or both. Often in the up-turning of items, more pathogens are released or exposed (mold, mildew, animal or human excrement, rotting food, etc.). Regardless, maintaining health and safety for you both is the professional’s responsibility. What resources are available for the hoarding population and their families? Digging Out: Helping Your Loved One Manage Clutter, Hoarding & Compulsive Acquiring, by Michael Thompkins, Ph.D. and Tamara Hartl, Ph.D.
What else do people need to know about helping people with hoarding disorders? Sheila Delson,CPO-CD® , is owner and President of FREEDomain Concepts, LLC, a professional organizing company, founded in 1994. She is a Certified Professional Organizer specializing in Chronic Disorganization (CD) issues, including AD/HD, OCD and Compulsive Hoarding. Although she works with the general population as well, she specializes in working with adults, seniors and students who experience severe disorganization difficulties as the result of neurological issues, trauma/loss, physical disabilities and illness, environmental conditions, and/or other related challenges. Services include…customization and hands-on residential and small business/ small office organizing, including paper and file systems, off-site Virtual Organizing (via telephone/visual media), workshops and seminars. Clients learn new concepts about time and paper management, project planning, goal achievement, containerizing and basic organizing principals. On request, Sheila also offers a 4-6 week skill-building clutter management program which is available to groups in the New York and Connecticut areas. Please call or write for more information. Sheila is a co-founder and Past President of the Institute for Challenging Organization (ICD) (www.challengingdisorganization.org,), (formerly the National Study Group on Chronic Disorganization (2000-2006), and is the group’s past Certification Program co-developer, past Education and Certification Program Director (2006-2008), and holds specialist credentials in CD, AD/HD and Compulsive Hoarding, and is credentialed as an ICD Master Trainer. 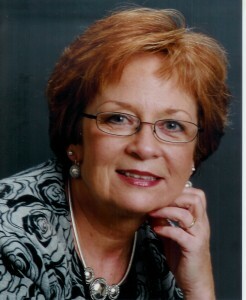 She has developed the Managing Your Clutter Program workshop series presented to groups on request. She is an active member of the National Association of Professional Organizers (NAPO), where she served as the National Award’s Chair (2009-2011) and currently serves as a committee member. She is a graduate of Leadership Dutchess Program, class of 2000. Sheila lives with her husband Jeffrey, two adult children, and three beautiful grandchildren in the Poughkeepsie, NY area. Media appearances…national network television programs, including FOX 5 TV GOOD DAY NY, and CBS-TV-NEWS THIS MORNING. She has been featured in WOMAN’S DAY magazines, the NEW YORK POST, PARENT’S MAGAZINE, POUGHKEEPSIE JOURNAL, and The Wall Street Journal, as well as a recent appearance on THE COOKING CHANNEL (Al Roker Productions). Additionally, Sheila has presented lectures and workshops for West Point Military Academy, the “New York Gets Organized” Conference, NAPO Chapters and annual national conferences, ICD conferences (2000- present), Professional Organizers in Canada, Barnes & Noble Bookstores, YWCA, Chambers of Commerce, and many other private schools, clubs and organizations. In early December of 2011, Sheila presented three workshops on chronic disorganization for the Japanese Association of Life Organizers (JALO) Conference, Fukuoka, Japan. 2008 Recipient of the ICD Highlighter Pinnacle Award Presented by the Institute for Challenging Disorganization for her significant contribution to the field of study in chronic disorganization.